Start your day right with this hearty and healthy breakfast! It's protein-packed and flavorsome. We would say, this dish will "had you at hello" on your 1st bite. 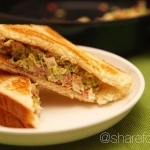 Broccoli and Chicken breast are the key ingredients of this dish and both are rank as the top 10 protein-rich food. To retain it's nutrients, steaming method is used to pre-cook the ingredients. Steaming moisturizes the breast meat which is the less juicy part of the chicken and also eliminate the need of using oil to cook the chicken. After which, the taste is further enhanced with the smokey ham and a tinge of tanginess from the fresh onion and garlic. Finally, topping it up with melted cheddar and mozzarella cheese is something that hardly anybody can resist. If you do have a little more time to prepare breakfast, fry a sunny-side up or chop some tomatoes, this combination will leave you wanting more. Try our Double Cheese Broccoli Chicken Sandwich today! Enjoy! Start your day right with this hearty and healthy breakfast! It's protein-packed and flavorsome. We would say, this dish will "had you at hello" on your 1st bite. If you do have a little more time to prepare breakfast, fry a sunny-side up or chop some tomatoes, this combination will leave you wanting more.